Happy Wednesday everyone, can't believe we're already in the middle of the week. 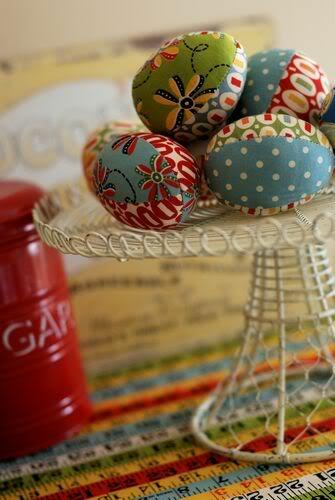 Remember yesterday I told that I would make some fabric eggs, following this tutorial from Retro Mama. Ouufff !! !I just finished sewing and stuffing them up!! 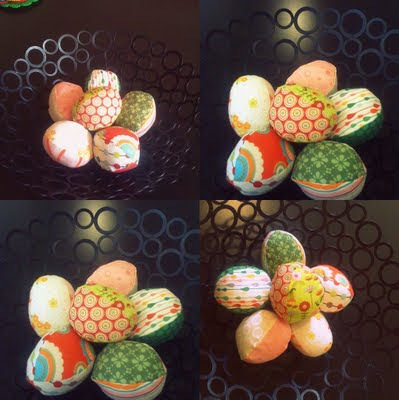 So with no further ado, here are my fabric eggs!!! You should definitely give them a try!!! They are not so difficult to make, the tutorial is very helpful, just keep in mind that they need a lot of stuffing!!! Darling! I really love them! You are fantastic as usual! These eggs are so cute! I love the bright colors. PS - I just became a follower, I'd love it if you followed me too! Thanks! Love your eggs! So cute. Great fabric combinations. really cute! I also saw the original post and thought about making them, but didn't get to it. I love yours! These are so adorable!! I am a new follower and visiting from Creative Itch!! Love your blog! Love these, thank you for sharing. I think they look adorable! What a cute idea! I'm new to your blog! I found you on FTLOB and can't wait to read more! Feel free to check out my blog as well! this is a super cute idea. I love your blog header btw. We are the champions my friend!! !